The dynamic duo behind Burgundy-focused restaurant Cabotte are truly at the top of their game. 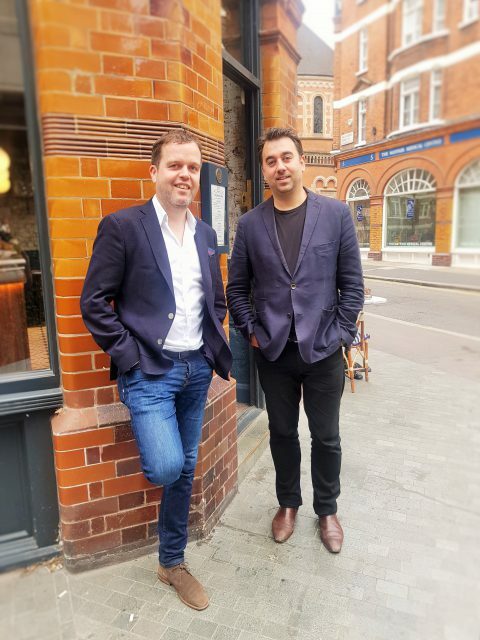 Both Master Sommeliers, Gearoid Devaney is also director of specialist importer Flint Wines, while Xavier Rousset owns Blandford Comptoir and Comptoir Café & Wine, and founded Texture and the 28°-50° Workshop group. Devaney, Ireland’s only Master Sommelier, has more than 20 years’ experience in the industry, having chalked up stints at Château Rahoul in Bordeaux and luxury-lifestyle service provider Sarment. Born in Belfast, his first role as a sommelier was at London’s Capital Hotel in 1997, where he quickly rose to the position of head sommelier when he was 23, and was instrumental in helping the restaurant gain its second Michelin star in 2001. In 2003 he helped open Tom Aikens restaurant in Chelsea, creating the wine list from scratch. He joined Flint in 2010, and in 2016 opened Cabotte on Gresham Street, near St Paul’s, with Rousset. Experienced restaurateur Rousset, on the other hand, owns Blandford Comptoir, a 40-cover “wine-led” Mediterranean restaurant in Marylebone, and Comptoir Café & Wine, a wine café with its own basement wine shop in Mayfair. At Comptoir, the wine list comprises around 1,000 bottles from around the world, including around 100 Champagnes, ranging from £13 a glass to £1,500 a bottle. Rousset also founded the Michelin-starred Texture restaurant and the 28°-50° restaurant group, alongside Agnar Sverrisson in 2007. He left the business in 2015 to focus on his new projects. A pupil of Gerard Basset’s at Hotel du Vin, in 2002 Rousset became the world’s youngest Master Sommelier at the age of 23. Like Devaney, Rousset also has more than 20 years’ experience in wine, having worked for the likes of Raymond Blanc as head sommelier at Le Manoir Aux Quat’ Saisons. Both Devaney and Rousset regularly consult for restaurants, judge on industry panels and speak at events. Cabotte, near Bank, boasts a 600-bin, 24-page wine list, of which 500 bottles hail from Burgundy, from Chablis to the Mâconnais, and with a good range of vintages. Among the other bottles on offer are English sparkling from Gusbourne and Gosset Grand Millésime Brut 1993 in magnum.